Back in October of last year I wrote nuclear power was a promising source of alternative energy. I also promised to write more on the topic. Last month I shared my thoughts in BCM’s latest Investor Letter (A Bright Future), I’ll reiterate my thoughts here. The simple fact is we need more energy than we have fossil fuel, so an alternative energy source is as necessary as it is inevitable. Some may gasp at the thought of it but nuclear power is actually a very practical alternative energy source. For one, nuclear power is among the cleanest energy sources available with respect to greenhouse gases. What may be surprising is nuclear produces even fewer carbon emissions than solar (because of pollution created during the solar PV cell production process). But what is truly remarkable about nuclear power is the sheer magnitude of energy it generates. The table below shows a relative comparison of energy generation per 1 kg of various fuels. The amount of energy created from 1 kg of enriched uranium (the fuel for nuclear power) is outstanding — 3.9 million megajoules for uranium versus just 10 mega-joules for coal! That makes nuclear power a highly-scalable and reliable source of energy. Meanwhile, more and more countries are embracing the virtues of nuclear and planning to increase nuclear reactor count. According to the World Nuclear Association China plans to increase its nuclear reactors from 34 to 96, with long-term plans in the 200 count. China’s plans alone will grow global reactor count by 50%, but China only represents only about a third of the global pipeline. Other countries planning significant additions include Russia, India, the UAE, and yes, even the USA. Taken together these circumstances point to an opportunity in the underlying fuel for nuclear power — uranium. Uranium prices peaked at around $140 / lb in 2007. With 2016 year-end prices at about $20 / lb, uranium was down by more than 85%, shown below. Heading into 2007 there was a uranium shortage scare that drove nuclear power providers (the main buyers of uranium) into a buying frenzy. Due to the highly regulated nature of uranium, and the time required to enrich it, nuclear power providers can’t allow their reactors to just run out of fuel, so they tend to secure their uranium supplies well in advance. As uranium prices climbed, providers panicked and locked in long-term contracts that only further inflated prices. Then the financial crisis hit and uranium prices plunged. Just as prices began to recover, they were hit again by the Fukushima Daiichi nuclear disaster of 2011. Since then both demand and prices have languished. However, many of the contracts signed circa 2007 are now coming due. As those contracts get renegotiated and more reactors come online demand should pick up. 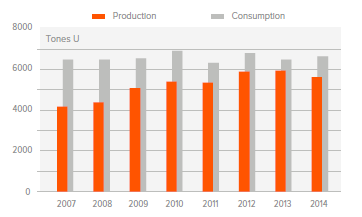 But even without that, the reality is current uranium consumption already outpaces current production, shown below. The shortfall has historically been subsidized by recycled uranium (decommissioned weapons and such), but those subsidies will inevitably run dry. A significant shortfall isn’t expected until 2020, but remember that nuclear power providers secure uranium supplies years in advance. At the same time, uranium producers won’t be incentivized to fill the shortfall unless they see their breakeven price of about $50 / lb. All things considered, uranium prices may have good upside potential at current levels or better. Of course, that upside potential isn’t without risk. Uranium is heavily regulated due to its use in weaponry. There isn’t a deep pool of buyers and sellers, so low prices won’t necessarily stoke demand as they might for other commodities. Since uranium demand is driven by power producers, there may be a glass ceiling on prices until nuclear power is more widely adopted. Meanwhile, uranium suffers from a lack of liquidity, it only trades thinly in an obscure corner of the commodities market and prices are often negotiated in private, further eroding transparency. These issues make pure exposure to spot uranium prices very difficult. The most practical alternative is indirect exposure through something like stocks tied to uranium production, like uranium miners for example. But that introduces separate risks as well. The bottom line, I think the confluence of decade-low prices, increasing demand, and the imminent need for practical energy alternatives make uranium exposure an attractive long-term proposition. Of course, short-term anything can happen, so do your homework and don’t bite off more than you can chew (afford to lose). This blog is for informational purposes only. Nothing on this blog represents advice of any kind. Investing is inherently risky and involves the risk of potential loss. Victor Lai is long URA.